It is an exciting time in a parent's life when a child starts to recognize his first words. For many kids, the first words they can recognize are their own names. Some kids may recognize familiar environmental print, like the name of a favorite restaurant or store. Some kids may start to read color words. Gradually, kids start to recognize a few sight words. Sight words are the most commonly used words in the English language. In fact, approximately half the words you encounter in day-to-day reading are sight words. Sight words can help a child build fluency in reading. As a reading specialist, I like to use sight words to help students build a reading vocabulary. I think they are particularly helpful with very early readers. They help children to develop the rules about how print looks. For instance, the word "the" always appears with the same combination of letters in the same order. It helps students understand reading left to right across a word. Of course, good teachers don't spend all of their time stuck on sight words. They try to move students along quickly, building up a sight word vocabulary, as they help children to grasp concepts about print. Once a child can control how print works, they are ready to break words apart and manipulate words. My son is right in the zone of learning sight words. He has just begun to notice that the text carries the meaning of a story. In fact, he still has one foot firmly planted in the idea that books can be "read" by just looking at the pictures. This is exactly where I want him! I want him to learn that stories make sense, and he can read by looking at pictures. At the same time, I want to move him to the next level of reading, learning to look at print. In order to do this, I have been noticing what he is noticing. I've been paying attention to the sight words he is acquiring and I have been making him little books using very repetitive text and clear pictures. He has been using these books to grasp concepts about print as well as build his reading vocabulary. I always start with something he knows and then I introduce one or two new words at a time. I've been using the printable books because they provide him with the context he needs to be very successful. 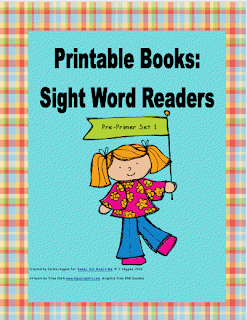 The printable books I've been using are based on the preprimer dolch sight word list. The first set incorporates the sight words see, can, the, is, where, we, go, in. There are 6 printable books in the first preprimer set. They are available with a teacher's guide in my teachers pay teachers store. These printable books are easy to make. All you have to do is cut apart and staple. If you'd rather make your own sight word books, there are tips on my bookmaking 101 page as well. We also created a Sight Word Booklet to keep a record of all the words my son can read by sight.